, do. It is simply brilliant.) On Wednesday, Nik blogged and encouraged everyone to put word-of-mouth into practice and spread the word about good books and good writing by blogging recommendations or by writing an amazon review. I already do that quite a lot with reviews here, on Amazon and GoodReads, so in honour of September 19th being Talk Like a Pirate Day, I thought I’d recommend the pirate books I love instead. My literary Pieces o’ Eight, if you like. by Arthur Ransome. If there is one author responsible for setting me off on my piratical treasure trail of reading, it is Arthur Ransome and his wonderful twelve-book series. Having read and loved them when he was a child, Dad gave me the books when I was nine. I devoured the whole series and regularly re-read them. Set in the 1930’s when children could play largely unsupervised in the summer holidays, the action in the first book takes place on a lake in the North (an amalgam of lakes in the English Lake District). The Walker children find Swallow, an old dinghy in the boathouse of the farm where they’re staying and use it to sail to an island (dubbed Wild Cat Island) where they set up camp. There they meet Nancy and Peggy Blackett, aka the Amazon pirates. They go to war to decide whose boat – Swallow or Amazon – should be flagship. The Blackett’s Uncle Jim, aka retired pirate Captain Flint, lives with a parrot on a houseboat on the lake. The children’s feud with him leads to the black spot and a great sea battle, which ends with cake and ice cream, as all the best ones should. , Ransome’s own tribute to Treasure Island. Set in the Caribbean, the children sail the Wild Cat schooner and hunt for buried treasure on Crab Island, while being chased by real-life pirates. by Daphne du Maurier. Growing up on the coast, in a town with fishing boats and a shipyard and surrounded by tales of smugglers and pirates, it’s probably unsurprising that I read Daphne du Maurier’s novels. This one has a beautiful, headstrong and bored heroine in Lady Dona St Columb and the French philosopher-pirate, Jean Aubrey, as its romantic hero. Irresistible. by Richard Hughes. When I read this book as a teenager, it shattered any cosy illusions I had, both about pirates and children. It tells the story of a family of English children who are being sent back to England from Jamaica by their parents but fall into the hands of pirates. It’s a story that haunts me to this day. by Alexander Exquemelin. A must-read for anyone interested in pirates, this is an eye-witness account by a surgeon who went out to work for the French West India Company in Tortuga in 1666 and enlisted with the buccaneers three years later. Yes, he actually sailed with pirates! Most notably, the infamous Welsh buccaneer, Sir Henry Morgan. by Captain Charles Johnson. This book is an incredible resource on pirates in the ‘golden age of piracy’. Thanks to the dramatic writing style and inclusion of lurid detail about the pirates’ crimes, the book was an immediate success when published, despite its author being an unknown. (One of the candidates is Daniel Defoe, author of Robinson Crusoe, writing under a pseudonym.) Blackbeard, Captain Kidd and Bartholomew Roberts went down in history, largely thanks to this book, and the modern idea of pirates stem from its pages. 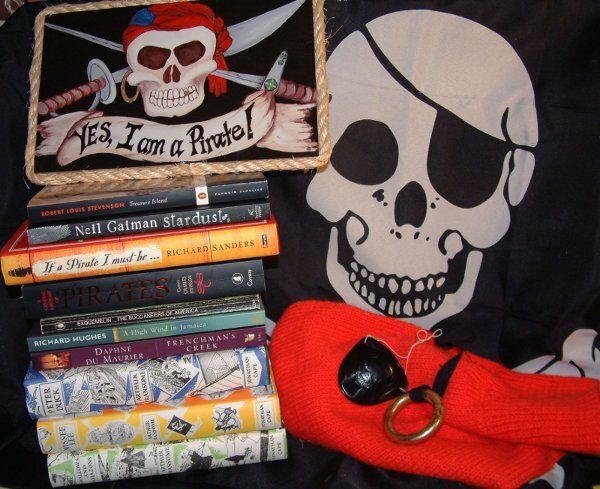 Novelists and filmmakers alike used the book as a source of inspiration for fictional pirates from Long John Silver to Captain Hook and it’s where many of the stereotypes, including marooning sailors, walking the plank, eye patches and parrots squawking “Pieces of Eight!” are believed to come from. by Richard Sanders. This is an excellent book all about Bartholomew Roberts, also known as Black Bart or Barti Ddu. Born John Robert(s) in west Wales, he had a highly successful career as a pirate, taking between 300-400 ships during the two-and-a-half years in which he was one. His story is all the more interesting because he didn’t conform to the pirate stereotype in a lot of ways. He drank tea, not rum, banned women and gambling from his ships and was more interested in talking to those he defeated than making them walk the plank. by Neil Gaiman. They don’t play a huge role in the book or the film but one of my all-time favourite writers deserves a mention here for the wonderful lightning-hunting pirates, Captain Johannes Alberic and the crew of the Free Ship Perdita. A refreshing update on the pirate theme that is pure genius. by Robert Louis Stevenson. Well, you didn’t think I’d leave this one off the list and risk the Black Spot, did you? Not only does it feature the iconic fictional pirate Long John Silver but two of the three real-life pirates mentioned in the book, Howell Davis and Bartholomew Roberts, are Welsh. The subject of countless movie adaptations, the now familiar cast of characters and their story endure and continue to be the gold standard (or should that be dubloon?) of pirate tales. I realise there are many more fictional pirates, like Captain Blood and Doctor Syn, that I could have mentioned here but I wanted to keep within the Pieces o’ Eight limit. (Let’s ignore the fact that I cheated with two additional Ransome mentions.) Do you have any fictional pirates that you’d include in this list or a type of person or character you read about a lot? There’s Captain Vanessa Scrimshaw, the pirate in a book Ghost Waves by W. Everett Prusso that came out last year. I reviewed it on my blog and Goodreads back when it came out. It’s a great read. I’ve just read your review on GoodReads and have put it on my wishlist. I’m always happy to find new pirates, and this book has a female pirate captain for a change! Thanks for the tip, Karen. I enjoyed Nik’s book too. I loved Captain Blood when I was younger (the Errol Flynn film, that is) and enjoyed Frenchman’s Creek, but have to admit to not having read any of the others. *gasps* …not even Treasure Island? And thanks Debs! That makes me happy! Love this theme! We are all about pirates around here at the moment. Little pirates. I bought Treasure Island to read with Mr6, but he’s a bit obsessed with Captain Underpants right now, so we’ve yet to get to it. But rest assured we’ll get there, by hook or by crook! You could always try out an audiobook of Treasure Island the next time you’re on a long car journey? It’s a fantastic listen.